Some time ago a showed a couple of long runs of Jack Sparling's late forties adventure strip Claire Voyant. Reently I finally cleaned up a full month of dailies. I am always amazed at how certain artist can manage producing both dailies and Sunday is such a realitic style. 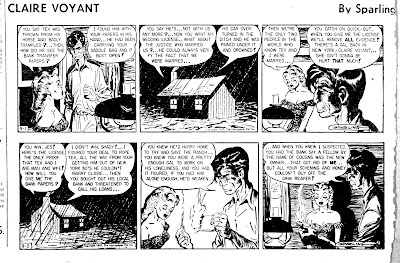 And Sparling was probably doing comics on the side, since the strip wasn't sold well enough to pay a lot (or to pay for assistants). The story itself has a lot going for it... and just as muc against it. It is told very disjointedly, in a way that requires a lot of remembering faces and characters. Something that might work in film or on tv, but must have been a pain in the newspapers. I turns out I already had three of the Sunday strips for this month, but they are no help. Although the Files character is given a little background, it introduced a new an seperate stryline involving him and his girlfriend, who isn't seen in the dailies at all. On the plus side, the story starts with a short introduction of Claire Voyant, always interesting. And it also features caricatures of 'Broadway' Billy Rose, Henry Morgan, Fred Allen and Milton Berle. Why a storyline involving a theatre play and a mysterious jynx called Ulcers would go to radio comedians for more information is amystery in itself for me and doesn't help move the story forward in any way. And most irritatingly for us, my clips end before we get to know who this Ulcers is and what will happen to the play. So you have been warned. I welcome any suggestions (or actual proof) as to who Ulcers is and why he brngs such bad luck.